Jill Prince, co-owner of Hal Prince Music and Entertainment talks to Jonathan Quartuccio of Westchester Wedding Magazine about how to get the best entertainment in any budget. Q: How far in advance should a couple book a band? A: A year in advance. Q: What type of music or songs do invited guests respond well to? A: It really depends on the crowd, but there are classics that never go out of style like Frank Sinatra, Motown, classic disco, and ‘80s music. This music is always popular. Q: Which ones do they not respond well to? A: Most guests do not like to be pushed into dancing to line dances. They prefer freestyle, unless a spontaneous conga line takes place, which is always fun. Q: How does the couple choose the music for their guests? Are there set playlists? Should they take requests? Q: Is there anything new couples want from their wedding band? A: No, but I would suggest that the bride and groom select a special last dance of the evening in addition to their first dance. Q: What expectations should couples have for a wedding band? Q: What type of interaction should the band have with the people? A: Some brides and grooms like a bandleader who interacts and gets out on to the dance floor with the guests during certain high-energy sets. This has become much more possible since most musicians and singers work wireless these days. However, this input needs to come from the bride and groom. I find that, most often, they just want the band to play to the crowd and keep it lively on the dance sets. Q: How diverse does the band need to be? A: I find that the best band is a band that plays everything from the Big Band era to the songs playing on the radio today. 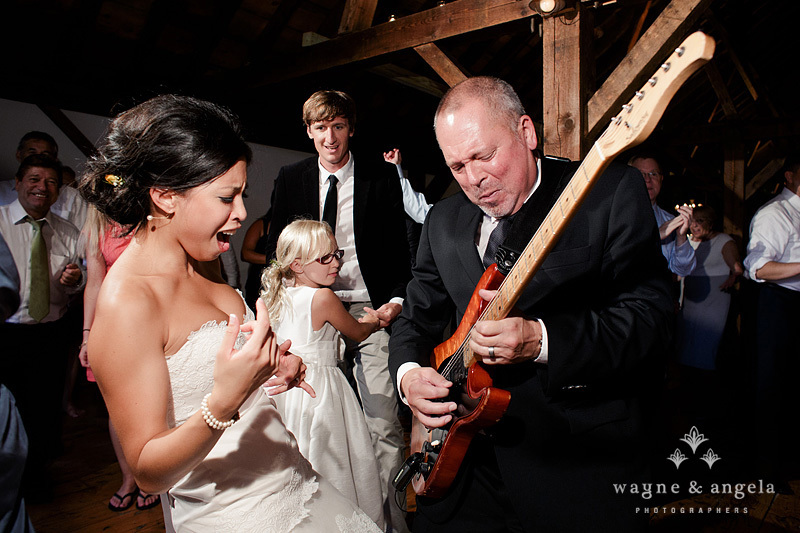 Most wedding audiences are diverse, so the band should be as well. If it is a younger wedding, without many older relatives, they can keep it more current. However, if a bride and groom are looking for very clubby, ‘of-the-moment’ music all night, we will sometimes suggest a DJ or a band and DJ combination. Q: How do you tip the band? A: Usually five to ten percent of the total bill is the norm. It is fine to give the tip to the bandleader, who can divvy it up among the musicians. Q: Do you include the band as wedding guests for dinner? A: Feeding the band is not required but it’s a nice gesture. The band arrives before your guests and is packing up after they leave, so they appreciate getting fed. Most venues offer a discount on meals for the band. Q: What is the typical price for a band at a wedding? A: Usually in the range of $1200 to $1500 per musician for four hours of continuous live music. Q: Some couples turn to a DJ or an ipod to save money. Why is having a band worth it? A: A band is certainly the most traditional. And having live vocals, a horn section, and musicians that improvise adds to the excitement of a wedding celebration. A DJ is certainly a less expensive option, but is still a good one as long as the DJ is well versed in weddings. I would usually suggest a DJ and an MC. In a sense, the DJ acts as the band, and the MC acts as the bandleader, organizing the evening and making announcements. To me, an iPod is not a great option; there is no spontaneity. At least with a DJ, you have someone watching the crowd and mixing music that makes sense. Q: How should a couple search for a band? A: Recommendations are always the best. Ask friends, venues, and other vendors in the industry like photographers and florists. Of course, if you’ve attended a wedding and loved the band, well, there’s your band! Q: How long should the band play? Should they play during the meal? A: Usually, the band plays continuously for four hours after the cocktail hour. During the meal, one to three musicians can play background music appropriate for conversation. It’s also nice to have one to three musicians playing background music for a cocktail hour. Thanks to Westchester Wedding Magazine for asking these fabulous questions. Look for an upcoming article when they speak with band leader, Jay Prince.